What kinds of moth are found in Cyrodiil? I don't think the names of Morrowind fortresses should be taken as indicative of actual species of moth - it's more like a fancy naming convention, not an actual taxonomy. Kert-silk: the lowest and most common quality of silk. This silk does not require actual animal carcasses, but is bred on a mixture of bonemeal, offal, and organic waste. The moths, likewise, are not of the pure breeding stock - the Voha, Niithe and Eau families are barely superior to the common butterfly. No precaution is made to spare these moths in the purifying process. This silk is more coarse than others, less color-fast, and does not maintain the soul. It is the most popular and widely produced kind of silk, and some houses, like the Bravil silkhouse, produce it to the exclusion of all else. Almost all common clothing is made of Kert-silk. Sometimes also called sailor-silk, as it is used to strengthen sails and ropes. Kur-silk: a respectable middle-class silk, not as common as Kert, but lacking the special qualities of the superior silks. It is grown on animal carcasses, supplied by local abattoirs and slaughterhouses, and the moth family at work is the Taath. This family is said to work faster and produce better silk when it hears music, as such, it is also called Choir-silk, as silkhouses have specially trained performers for this task. Mori-silk: a subset of Kur-silk, grown only on bull cadavers. Mori-silk is used in the production of Imperial banners, flags, and the regalia of the Emperor. Permission to wear bull-silk may be granted by the Emperor, and many Nibenese aristocrats and merchant families have gained this hereditary privilege. Glyph-silk: the silk of the glyphmoth, raised exclusively on a diet of old paper and books. The silk of the glyphmoth is used to make paper for powerful magical scrolls and books, and has many special properties for those who know how to use it. Very popular among mystics, the Mages Guild, and the Imperial administration. It is a specialty of the Cheydinhall and Mir Corrup schools. Ancestor Silk: silk of the Riil family, the true Ancestor Moth, cultivated on human remains. Silkhouses have special crypts for this purpose. Moth-burial is the oldest of the Nibenese burial-forms: the deceased gives up his corporeal shape to the moths, that they may grow in it, and in return the moths transpose his soul to the silk. The silk is then added to his ancestral weave, his Ancestor Silk, strengthening his bloodline and safeguarding his soul. The bones are returned to the family, to dispose of as they see fit. Moth burial is no longer very popular in the Niben. Luna Moths actually feature in Skyrim. I do like the idea of them being associated with Dibella: they could feature inside her sanctuary, and provide some mythic insect action on the otherwise moth-deprived west coast. Blight moths are mentioned in lore, but only appear in Morrowind, where they are responsible for the local, inferior kinds of silk. Perhaps they could feature as an imported species in Cheydinhal. A Blood Moth sounds a bit too metal, maybe, though it does remind me of an idea from a while ago: a necromantic creature based on a moth, featuring in the Niben. The Nibenese believe that their spirits are connected to the moths when they die, so it would make sense for local necromancers to capitalize on that (especially the mysterious Moth Eaters that are said to lurk in the jungle). Ah, somehow I had missed that though I've read that text several times before. I like those plans a lot. I think I read on the TR forums that the fort names (except frost and fire) are names of actual (real world) moth species, though they don't need to feature as such in the game. Those are real bugs? Interesting. They could feature as replacement/translations of Voha, Niithe ad the rest: those are ald-nedic words I made up in a minute or so, not really attached to them. The only exception would be the word Riil, which means "ancestor" according to Lady N's Silk text. Featuring Luna moths in Dibella's temple (and other kinds of moths in the sanctuaries of Kynareth and Arkay) is a great idea. The assets would not be very difficult to make if we base ourselves on the dragonflies from Bethesda's Bitter Coast plugin. Bethesda, at least, definitely wants us to associate luna moths with Dibella. I think Sload was the one who posted it, haven't done any research on it myself. Your plan seems solid though. 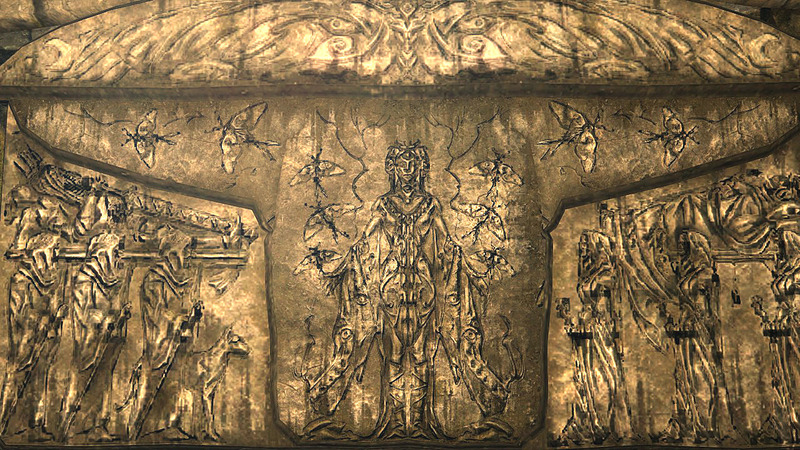 Moths in chapels is definetly a way to mystify the Cyrodiilic cults compared to the medieval cathedrals of Oblivion. Very cool find Saint_Jiub! I was just making stuff up when I read "live only to mate", but everything ties together.